The Aquarius radiometer operated within a band protected from radio frequency emission, which was designated for scientific research. Nonetheless, radio frequency interference (RFI) was still detected in some areas, particularly over land. Where did it come from? Examples of RFI sources include air-traffic control radars, telecommunication links, and consumer electronics. 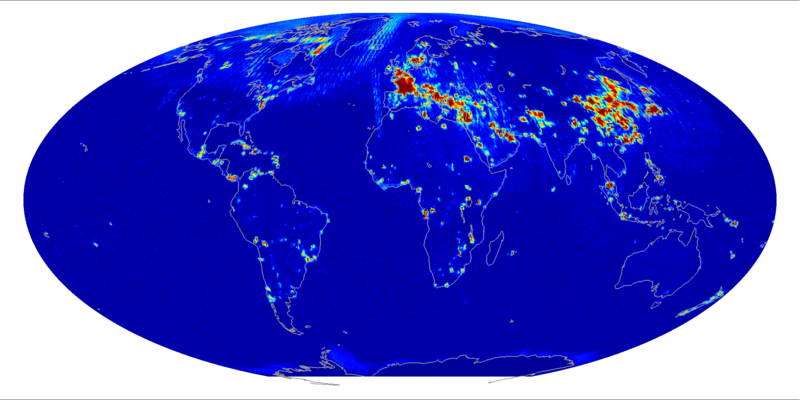 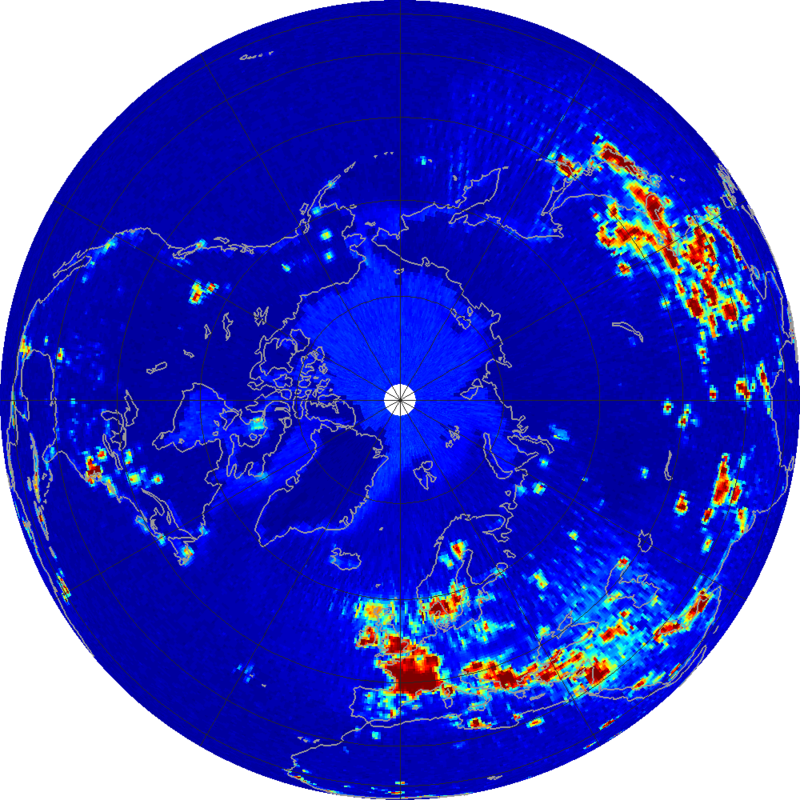 Each data point represents the average radiometer measurements over 1.44 seconds (the fundamental data block in Aquarius Level 2 data). The color scale indicates the percentage of radiometer measurements within this window that are identified as RFI by the RFI detection algorithm (Le Vine, et al., 2014). Measurements identified as RFI are removed from processing and not used to calculate salinity. Red colors indicate areas where over 80% of the sampled data are flagged for RFI presence. Dark blues show relatively little detected RFI, with less than about 10% of samples flagged in these regions. An additional RFI flag is used to identify locations where the measured brightness temperature over land exceeds the expected limits of surface emissivity (Soldo et al., 2017). This flag is not used to remove samples from further processing, but in generating the RFI maps, 100% RFI is assigned to data points where this flag is raised. 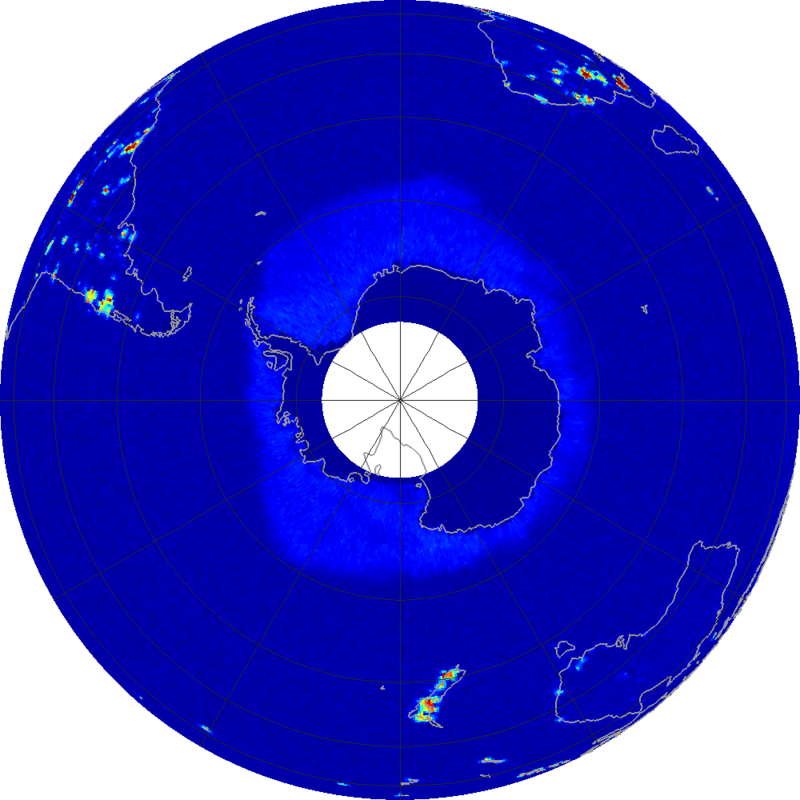 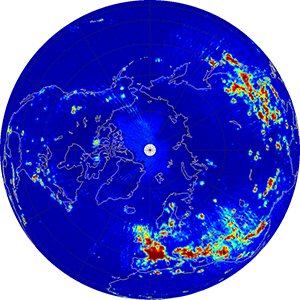 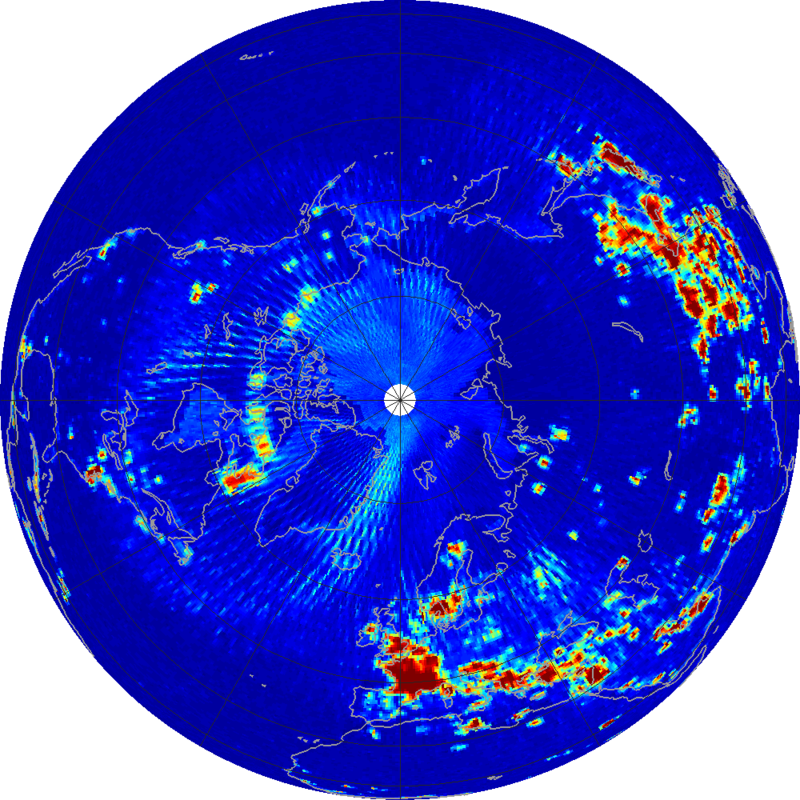 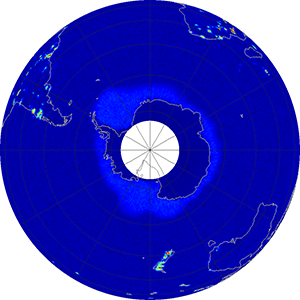 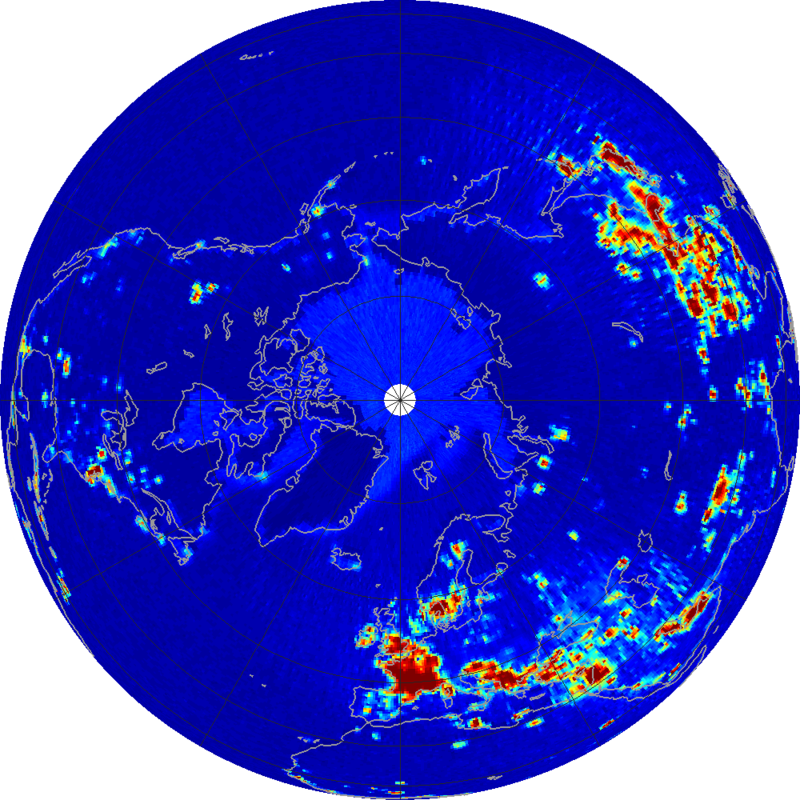 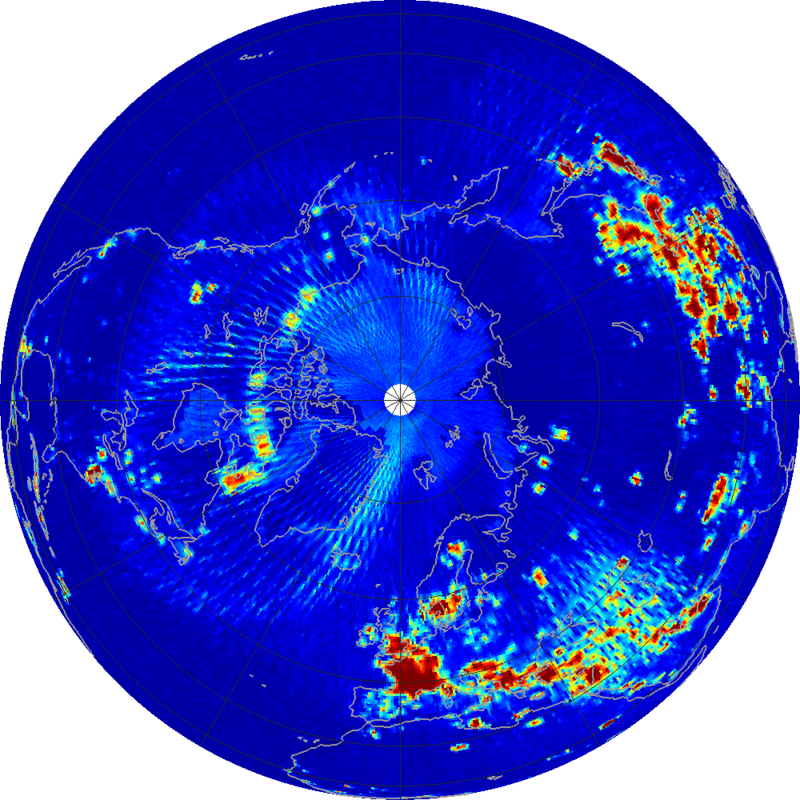 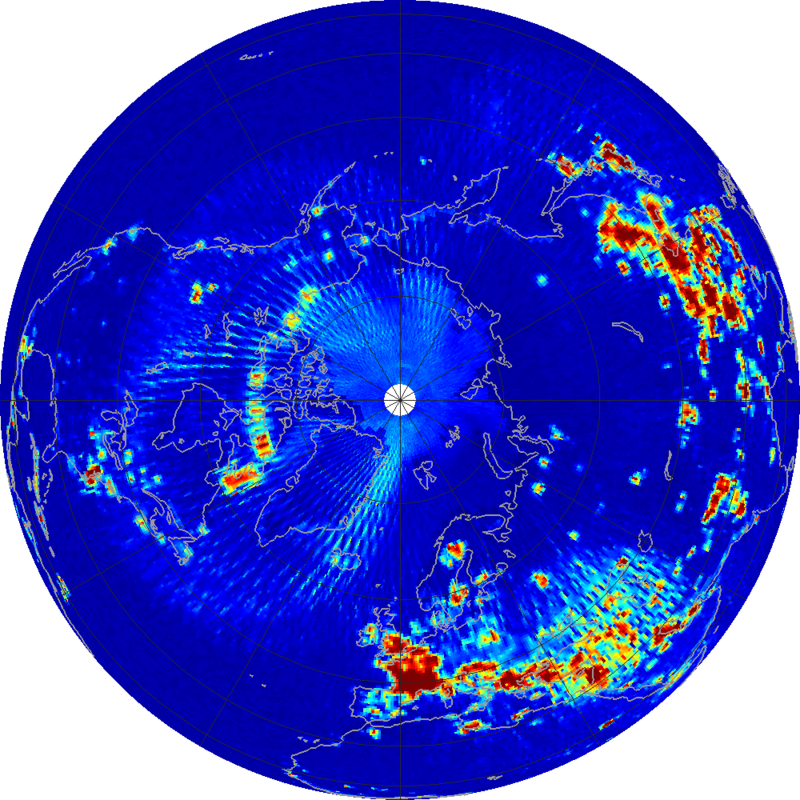 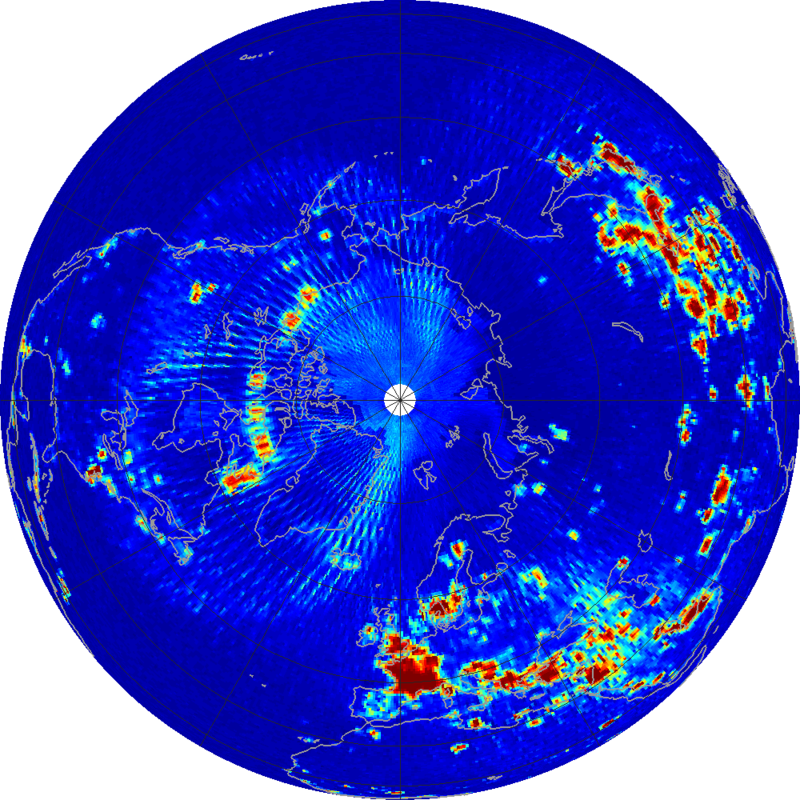 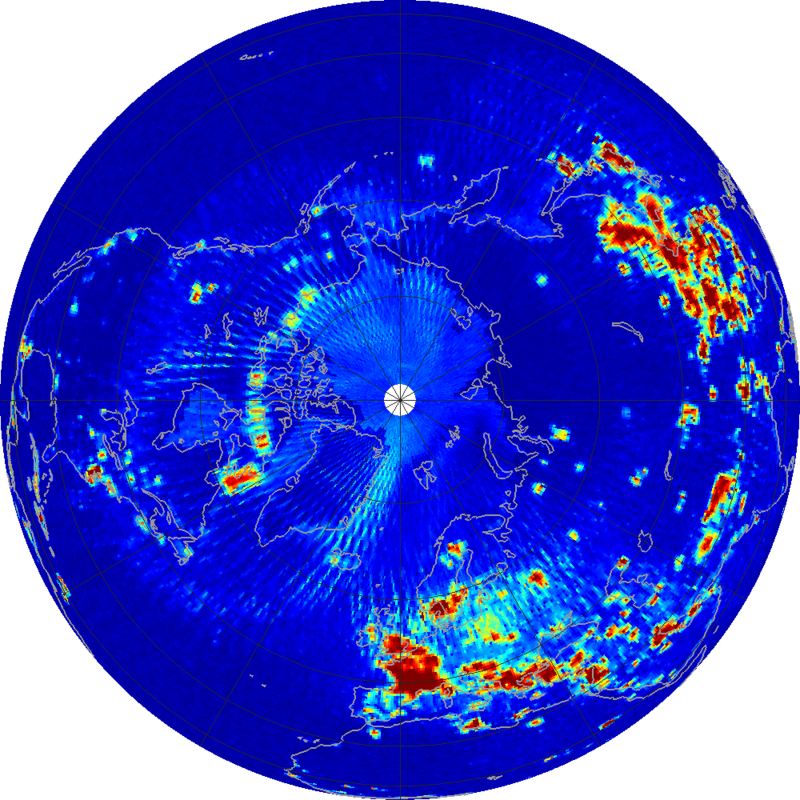 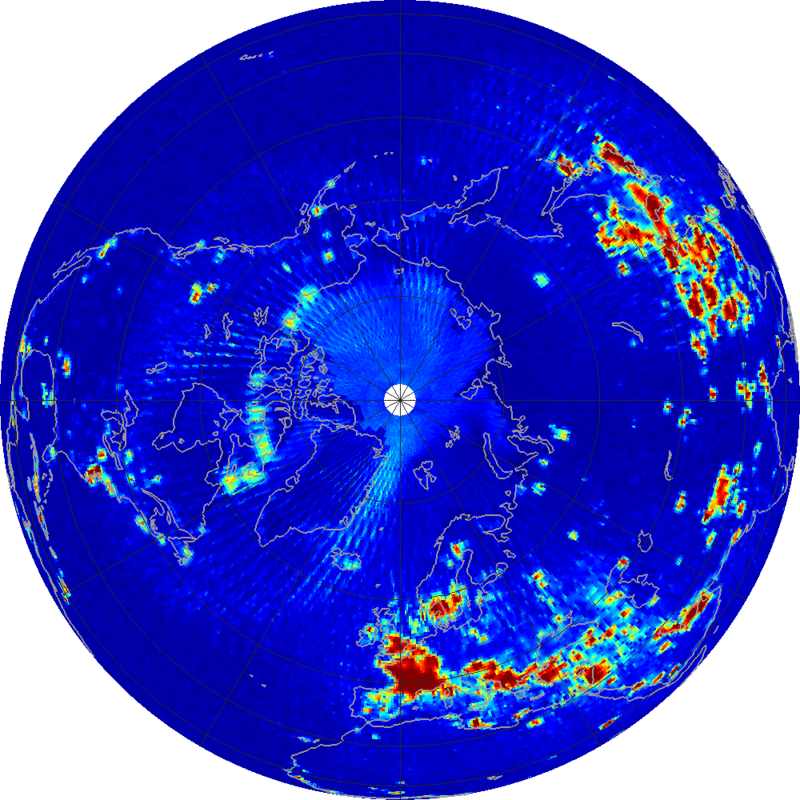 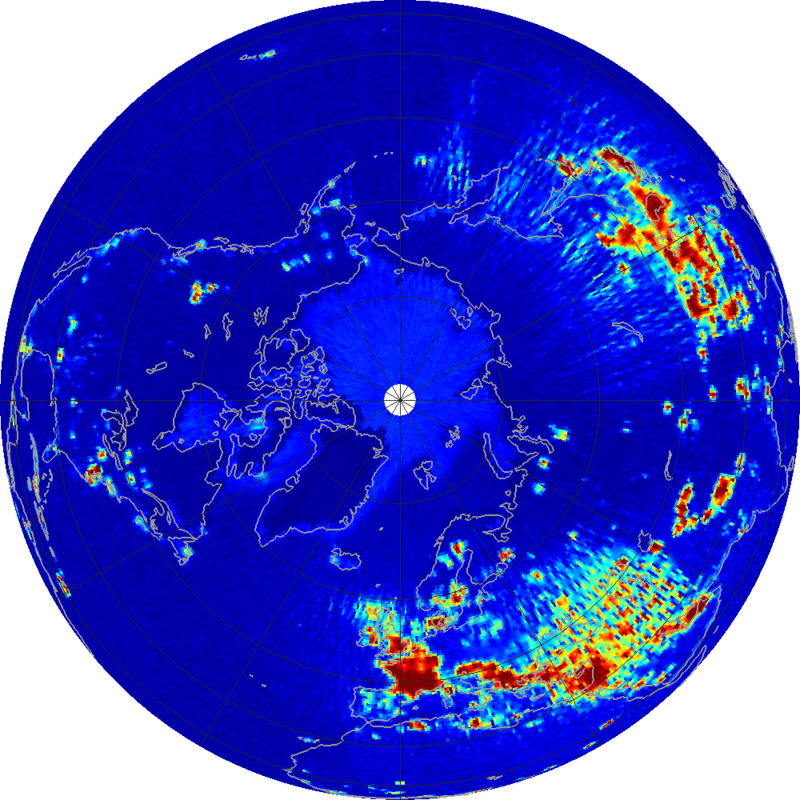 The lighter blue areas in the polar regions are an artifact of the particular processing used to detect RFI which is based on the standard deviation of the measurements within the 1.44-second averaging window. 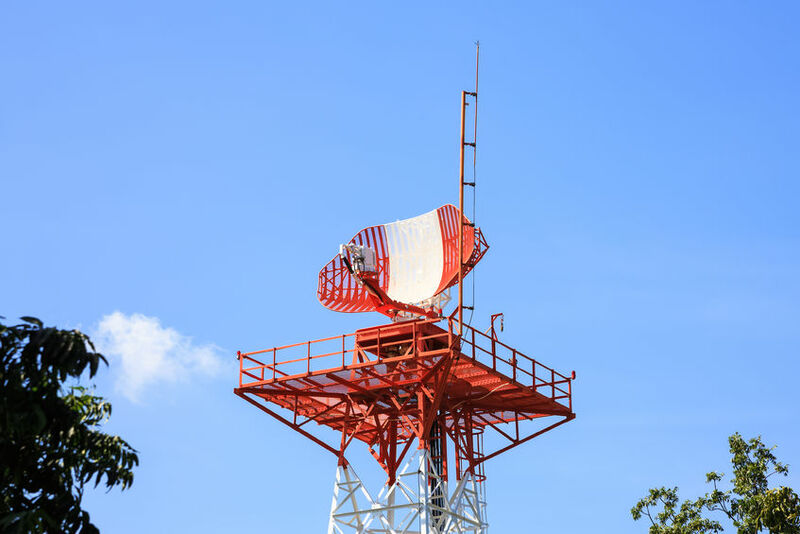 The processor identifies as RFI samples that show a relatively large deviation from average even if they are not affected by RFI. This effect, usually referred to as false alarms, has been accounted for by using different RFI algorithm parameters on ocean and land, but it is still present on sea ice whose constantly changing extent makes a tuning of the algorithm parameters over it unpractical. Soldo, Y., Le Vine, D.M., de Matthaeis, P. and Richaume, P., 2017. L-Band RFI Detected by SMOS and Aquarius, IEEE T. Geosci. 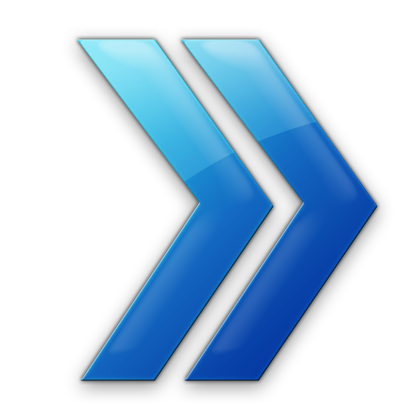 Remote, 55 (7), 4220-4235.